Twenty-one men representing China’s most powerful institutions file into a conference room atop the icc Tower looming over Victoria Harbor. The Politburo Standing Committee has mustered the ceos of China’s four largest banks, Sinopec, and several other state-owned multinationals, plus officers from the Central Military Commission and a pair of academics from China’s top technology universities. And now, the marching orders. The order from the stone-faced secretary sounds broad, even bland. But it means very specific, very powerful things to each man in this room. It means pulling the trigger on a huge number of massive initiatives. And it’s backed by more than a trillion dollars. It’s a normal day on Wall Street. Markets are up after last week’s Fed announcement of QE6. Thanks to this latest round of money-printing, gold is holding at $2,000 per ounce, oil is $95 per barrel. The dollar index is steady at 82. Squawk Box is running a story saying China’s new East Asian free-trade zone seems to have been fast-tracked. Mongolia, Vietnam, Cambodia, Thailand and China’s recently reincorporated province of Taiwan are all sending signals that they’re suddenly ready to sign up. Trade will be conducted in Chinese renminbi. An Associated Press story getting some play quotes an unnamed official from Japan’s Ministry of Finance saying that since most of Japan’s trade is now with China, it too will eventually be forced to join the East Asian Prosperity Cooperation. Even Australia is considering participation. The markets yawn. Thirty minutes later, trading resumes—with an eerie calm. With this shock announcement, Russia becomes the world’s third-largest holder of gold after the European Union and China. Putin adds that Moscow is also negotiating for entry into the East Asian Prosperity Cooperation and, starting in January, will use the Chinese yuan for international currency transactions—with the notable exception of oil and gas exports to Europe, which will now be priced in euro marks. Putin’s itar-tass transcript goes viral. Twitter and Facebook explode. To Wall Street and the world, it is now clear that something momentous is happening. It looks like a pre-planned attack on America’s anemic economy. Before Putin finishes his announcement, investors erupt in sell orders. The Dow plummets 30 percent in nine minutes. Institutional investors dump U.S. treasuries at fire-sale prices—trying to get out before China unleashes its hoard. Jim Rickards is on cnn saying it’s a “full-on revolt against the dollar standard.” The ZeroHedge blog has it up in doomsday 100-point font: “Is this the start of WW3?” Rumors begin to swirl on the trading floor and on tv screens around the world that America’s biggest banks are caught short and unable to cover their multibillion-dollar positions in the derivatives market. Bank of America ceo Brian T. Moynihan denies that the bank has a liquidity problem. Citigroup ceo Michael Corbat calls the buzz about his bank’s derivatives positions “malicious rumors started by speculators that are just false.” The bank is “fundamentally sound,” he insists. Warren Buffet warns of contagion to the insurance sector. Visibly agitated, Federal Reserve Bank Chairman Ben Bernanke says that due to market conditions the Fed will temporarily purchase “unlimited” amounts of treasuries to restore confidence in the market. “The Federal Reserve is committed to a strong dollar policy and any damage to the banking system is limited and contained,” he said. In an hour and a half, the dollar has lost more than half its value. Fox News is saying people should spend their dollars now before they are worthless. Dennis Kneale is actually comparing the collapse of the dollar to the Argentine peso and the Greek drachma. Riots are reported in shopping malls and business districts across several major cities, as people awake to the fact that the value of their cash is evaporating. Their savings and investments have lost more than half of their purchasing power compared to other currencies. Local news footage shows empty store shelves and malfunctioning atms. People panic and rush grocery stores to stock up. Customers claim widespread price gouging. Mobs of young people rampage through Birmingham, Cincinnati, Chicago. 1:02 p.m. EST, Washington, D.C.
President Obama holds an emergency press conference. “This morning, December 7, 2015—a date that will live in infamy—the United States of America was suddenly and deliberately attacked by overseas governments in an attempt to discredit the dollar and take away its status as the world’s reserve currency. “Let me be clear: To even entertain the idea of the United States of America not paying its bills is irresponsible. It’s absurd. “Some have questioned the integrity of our nation’s bullion reserves. Believe me, the gold is there. When Germany requested its gold holdings back, we began returning it. I now urge my German counterparts to confirm Europe’s commitment to using the dollar as a reserve currency. “I have authorized Chairman Bernanke to implement capital controls to prevent millionaires and speculators from taking money out of the country. I am also issuing an executive order that will limit private ownership of gold. I am also directing Congress to pass new tax legislation and tariffs on Chinese goods. The plunging markets go into free fall after the president’s announcements. Gold jumps another $800, silver is at $175, oil at $250. The dollar hits an all-time low. Investors around the world flee the dollar. American cities have started to burn. Although the dates and events in this scenario are obviously fictitious, the principle isn’t. In fact, such an economic disaster is imminent enough that the Pentagon held its first-ever financial war games back in 2009. Instead of carrier movements, tactical strikes and aerial bombardments, the weapons were currencies, stocks, bonds, interest rates and derivatives. But just like real war exercises, the purpose was the same: to discover fatal weaknesses and how the enemy might exploit them. Wall Street banker Jim Rickards participated in the war games. In his book Currency Wars, he writes that the Pentagon is clumsy at financial warfare. Financial war is not beyond America’s horizon. Whether or not politicians and the Fed will publicly acknowledge it, the war has already begun. While the U.S. and other governments might throw out phrases like “commitment to a strong dollar” every now and then, what many of them are actually doing is actively and openly devaluing their currencies to gain unfair short-term economic advantages. Faced with unacceptably high unemployment and a stagnant global economy, the world’s leading economies are resorting to currency manipulation to steal a greater piece of a shrinking economic pie. The short-sighted goal is to weaken the currency to make domestic goods cheaper for foreigners to buy and foreign goods more expensive to purchase. This beggar-thy-neighbor strategy is highly contentious and potentially explosive. In 2012 alone, global central banks cut interest rates 75 times in an effort to weaken their currencies. Regardless of who started it, the war is heating up. When Shinzo Abe was elected prime minister of Japan in December, it heralded a new stage in the global currency war. He immediately announced that Tokyo would no longer be neutral. It would implement a massive $1.4 trillion quantitative easing (money-printing) plan to reduce the value of the yen. He said the yen had risen too high (in reality, the dollar, yuan and euro had fallen, making the yen appear to have risen). He then bullied the Bank of Japan into doubling its acceptable inflation level. Abe’s intent was plain: to boost job creation by the same artificial means employed by the U.S. and China—currency devaluation leading to increased exports. And he was very open about it. Bowing to the pressure, the central bank announced it would potentially buy unlimited amounts of government bonds. Since then, the yen has lost 25 percent of its value against the euro and about 13 percent against the dollar—and Japan’s exporters grabbed market share. “Ever since the new government took control, it feels as though Japan is filled with the spirit for economic revival,” Toyota executive Takahiko Ijichi said in March. Outside of Japan, Toyota’s competitors are filled with a different spirit. Just hours before the boj announcement, German Bundesbank President Jens Weidmann warned that populist governments threatened to unleash competitive currency wars, as politicians pushed central banks to weaken currencies and steal trade. It was a message aimed at the big powers: America, China and Japan. Monetary policy risked becoming a political tool, he warned. But joint platitudes aside, the world is fully engaged in currency war and stands on the brink of full-scale trade war. 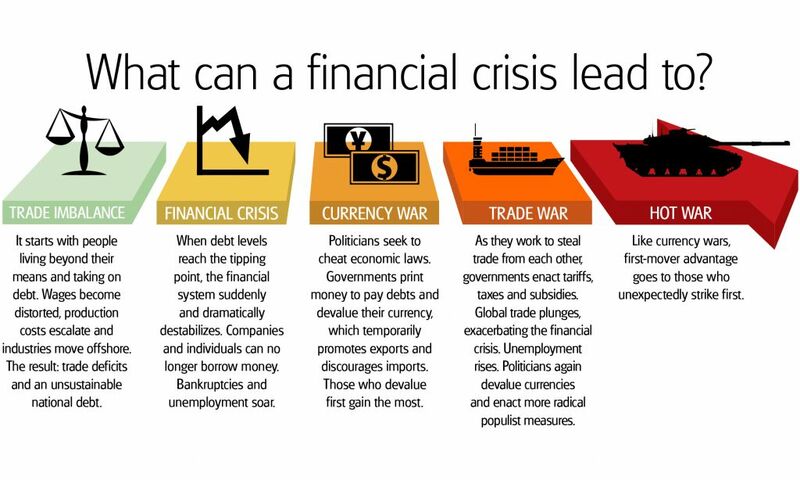 What can a financial crisis lead to? It is as if the world is back in the 1930s. Back then, it was Great Britain that set off the chain reaction. Following the failure of Austrian bank Creditanstalt and another bank in Germany, Britain was forced off the gold standard and devalued the pound. Norway, Sweden and Denmark quickly followed. America held off until 1933, when President Roosevelt confiscated all gold held in U.S. banks before devaluing the dollar against gold by 41 percent. By 1936, Germany, France and the rest of Europe had abandoned the gold standard and were devaluing too, all in an attempt to renege on debts and steal trade. When the short-term boosts gained through currency devaluation were exhausted, nations increasingly turned to tariffs, taxes and trade barriers to protect local industries and jobs—all of which worked to retard economic recovery, increase social unrest, and escalate grievances between nations. What happened next in 1939 is well known. The currency-war-turned-trade-war was transformed into World War ii by a madman. Today, we see history repeating. It was a thinly veiled reminder of what several Chinese officials have intimated over the past few years: that America’s biggest creditor nation holds a disproportionately important role in maintaining the dollar’s status as the world’s reserve currency—and that if America isn’t careful, China could strip the dollar of that coveted status. China isn’t alone in preparing for the post-dollar world. In March, China joined with Brazil, Russia, India and South Africa to create a brics bank to fund international development outside the purveyance of the U.S.-based financial system and the World Bank. In March, China also announced a $30 billion currency swap with Brazil designed to make each nation less reliant on the U.S. dollar. That same month, it also announced that it was concluding a deal with Australia to cut out the U.S. dollar middle man and conduct bilateral trade in yuan. In this case, it seems to be Australia that is pushing for the deal. 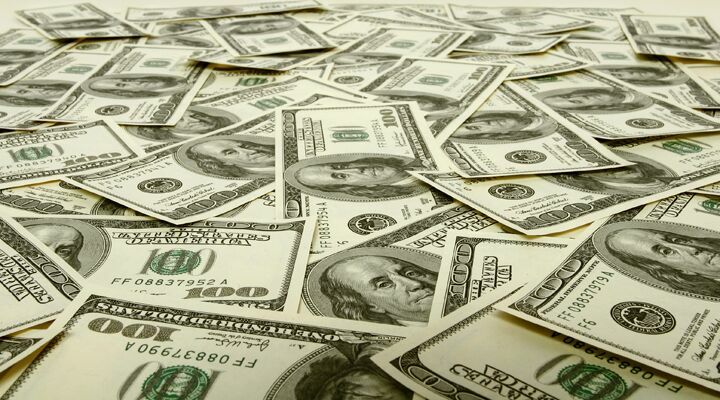 The two countries conduct a whopping $120 billion in trade each year. China is also bypassing the dollar in bilateral currency deals with Japan, India and Russia. We are now in the late stages in the run-up to World War iii—locked in a vicious currency war that is getting ready to morph into a trade war. And in today’s high-speed electronic world, the train wreck will happen much faster. The slide from currency war to trade war to hot war could be orders-of-magnitude faster—and orders-of-magnitude more damaging. Experts say those countries that first devalue their currencies gain the most. The same could be said about actual war. Those countries that act first—surprising their rivals—gain a distinct advantage. When Japan surprise-attacked Pearl Harbor on Dec. 7, 1941, it hoped it would be a catastrophic blow to America, and it could have been.